Click here for video of Carencro going wild after winning state championship. Click here for story of Carenro's dramatic win over Woodlawn in the state 4A finals. Click here for Chris Kovatch's Athletic Network profile. Pardon Carencro coach Christopher Kovatch if he’s had to battle a little nostalgia this week as he’s prepared his No. 5-seeded Golden Bears for Friday’s 6 p.m. Class 4A state championship game against Woodlawn at Burton Coliseum in Lake Charles. He just can’t helping thinking back to all the many roads he’s traveled to get this program to this point. 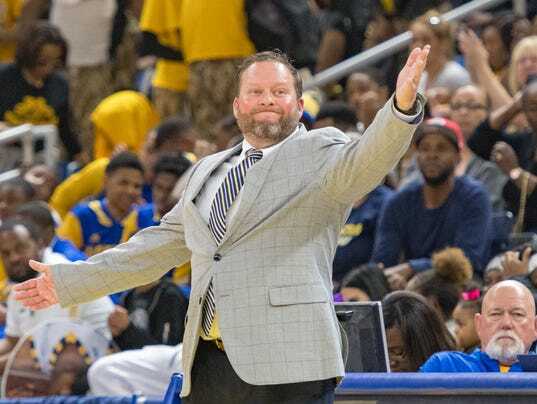 In fact, when Kovatch first arrived at Carencro High 19 years ago, he declined an assignment to be a boys basketball coach. To get an idea of the program's state at that point, the Bears’ record the year before he took over was 0-24. Instead, the former javelin thrower at Brother Martin, SLU and UL under his mentor Charles Lancon learned more about the sport as a girls basketball assistant under Rhonda McCullough with the Lady Bears. After a year, Kovatch relented and began coaching the boys. “Since then, it’s been uphill, downhill and all the valleys in between,” Kovatch said. What knowledge and experience he didn’t have as a basketball coach, he made up for with hard work. When that road began for Kovatch, Carencro High was still in the middle of a highly successful football run under coach Mac Barousse. Basketball was beyond an afterthought on the campus. It’s not that the Bears never had any talent until this season. It’s that they’ve never had a core group as deeply talented and committed as this year’s senior group. Carencro High assistant coach La’Ryan Gary remembers his senior season in 2006 when the Bears got off to a great start — “something like 15-2 with the only two losses to (state champion) Northside” and some basketball fever was beginning to stir. Patrick Richard was a sophomore and Ricky Johnson was a freshman. But an ineligible player, an injury and then a school disciplinary action squashed that stellar start. “We went from be a really good team and potentially a powerhouse in Class 5A to a mediocre team,” Gary said. So when the wheels began to come off a bit for the Bears during District 4-4A play earlier this season, Gary began drawing some eerie parallels to his senior campaign. Through it all, though, the other memory Gary couldn’t get out of his mind was the message Kovatch and this group of seniors gave me when he first returned to Carencro three seasons ago. Before they let the slump destroy this season, being reminded of that original goal helped bring the team back together. From a strategy standpoint, the slump also prepared the Bears for this historic run to the state finals by making them more defensive-minded. That’ll certainly be a challenge against one of the state’s most high-flying offenses in Woodlawn. Of course, at this point, the Bears will take a win of any kind. “I think what it’ll do is bring back the excitement that Carencro has for football, but bring it back to all the sports,” Gary said. “Not only are we a football school, but we play a lot of other sports too. We have the athletes and the coaches to lead them in other sports as well. For Kovatch, a win Friday would put an exclamation point on his career-long journey. “It’s one of those things you talk about and dream about,” he said. “It’s at the end of every sentence as you prepare your team at the beginning of the year when you’re in the weight room. It’s kind of surreal.